Customer supervised units are units where the renter will be responsible for watching the unit and the children on the unit. Your installer will go over all safety considerations and train you on the proper use of your rental during its setup. An adult must be supervising the unit the entire time it is inflated. If you would prefer to have Jumpmaxx operate a Customer Supervised Unit we can send an attendant to your location to supervise the use of your rental. You can find more information about adding an attendants to your rental on our Attendants page. Jumpmaxx Supervised are units that require special training, Jumpmaxx will send an trained attendant to operate and watch out for the safety of your children during their use of the unit. Busy Kids Make Great Parties, and Jumpmaxx wants to help you do that for less. We are your Moonwalk Bounce House and Jumping Castle company. This is a front load 18 Foot Ocean Waterslide. This slide does not have a pool the landing will hold about 3 inches of water for you to splash in as you slide down the 18 Foot Ocean Waterslide. Jumpmaxx wants to be your party headquarters. We want to make every event thrilling and provide safe entertainment. Your children will have endless hours of joy slip sliding the rapids on this long inflatable slide. You must have access to water so delivering it to the parks is not possible. Please measure the area to make sure it will fit in the space required. Order early for the summer! Jumpmaxx will Deliver your slide for no extra charge within the Tucson Area. For Deliveries outside of our delivery area call for prices. The 18 Foot Ocean Waterslide Requires 1 20 Amp dedicated outlet to plug into. There is a mister hose above the slide that connects to your garden hose that will keep the slide wet for continues hours of fun. You must provide the hose. JumpMaxx has worked hard and long to provide to you the most unique and wondrous inflatable products to entertain your family and guests at any party, event, and fund raiser. How else can Tucson, Az keep its cool in its unbelievable heat other than a trip to Mt Lemmon? Call now to book at (520) 445-8029 and find out for yourself to see why JumpMaxx believes that busy kids make great parties! We appreciate your business and love reviews! Don’t forget to like us on Facebook, link is at the bottom of this page. Book early as this inflatable is in high demand and it is first come first serve. 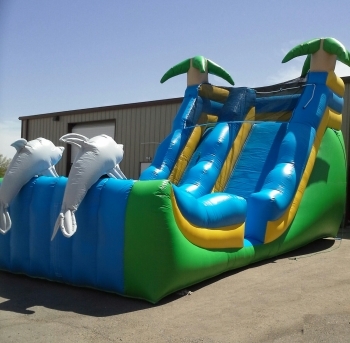 JumpMaxx prides ourselves in providing America with newer, cleaner, high end entertainment with inflatables like the 18 Foot Ocean Waterslide and many others.